DECs (Display Energy Certificates) were introduced in 2008 to increase awareness of energy efficiency within public buildings. There was a review that changed some of the qualifying criteria in 2015 so that all public buildings or buildings that are frequently visited by members of the public over 250m² need to display a DEC.
Any building accessed by the public that in some way receives public funding and with a floor area of 250m² or above will need a DEC. If your building is between 250m² and 999m² the DEC will remain valid for 10 years, any building with a floor area of 1000m² and over needs their DEC renewing annually. Each building that requires a DEC also needs an advisory report, the advisory report for a building over 1000m² will remain valid for 7 years. However, the advisory on a smaller building will remain valid for 10 years like the DEC in that case. What does a DEC actually display? 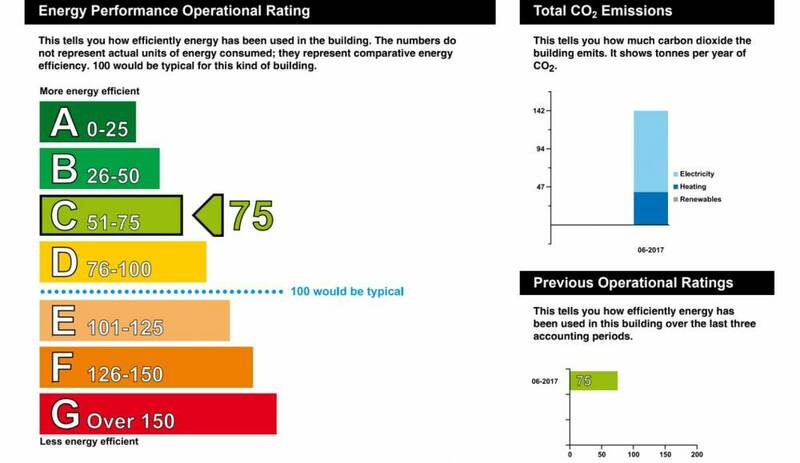 The chart, much like the energy efficiency labelling of a fridge or a washing machine, shows how efficient the building is compared to an average building of its size, 100 being average. It uses letters A-G and some colour coding to show clearly how the building compares. Anyone who fails to display a valid DEC can be fined £500, whereas anyone not in possession of a valid advisory report can be fined £1000. In addition to these fines the organisation will be required to commission a valid certificate/report or face further fines. Don’t get caught without one, Utilitas can ensure you are compliant with our DEC service. We will carry out a background check, collate your consumption data and determine whether you need either a DEC and/or an Advisory Report. We will then process the data using the Government approved OR Calc (Operational Rating Calculation) to generate your DEC. If an advisory report is required we will also do that, then just before delivering your DEC/Advisory Report we will log the results and validity with the Government database held by Landmark. Once on our system we will always ensure you are up to date and compliant.